The total cryptocurrency market performance for the last seven days has been quite average with a few coins rising to the occasion. The total market cap increased from $122 billion to $124 billion in the last seven days with Bitcoin dominating the market with 52.49%. XRP constituted 10.9% of the total market cap, and Ethereum also represented 10.4%. Coins like Icobay (IBT) and Empowr Coin (EMBR) recorded a significant drop of 94% and 76% respectively followed by some few other digital assets in the last seven days. However, there are few selected coins which had positive growth and three of such coins are introduced below. Everus was the best performer of the week among all the existing cryptocurrencies with a percentage rise of 403%. This digital asset outperformed all the big guns moving from $0.010 on 12 January 2019 to $0.05 on 19 January 2019. This digital asset currently has a market cap of $11 million. Also, it has an available supply of 456 million and a total supply of 1 billion. Everus is expected to continue its impressive run. Everus is not much popular and does not have a sizeable community. 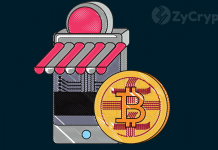 However, its motive of seeking to leverage the Ethereum blockchain for its services like exchange and ATM will possibly take it to the top. APL is another digital asset that recorded a significant rise from down the price curve to the top. 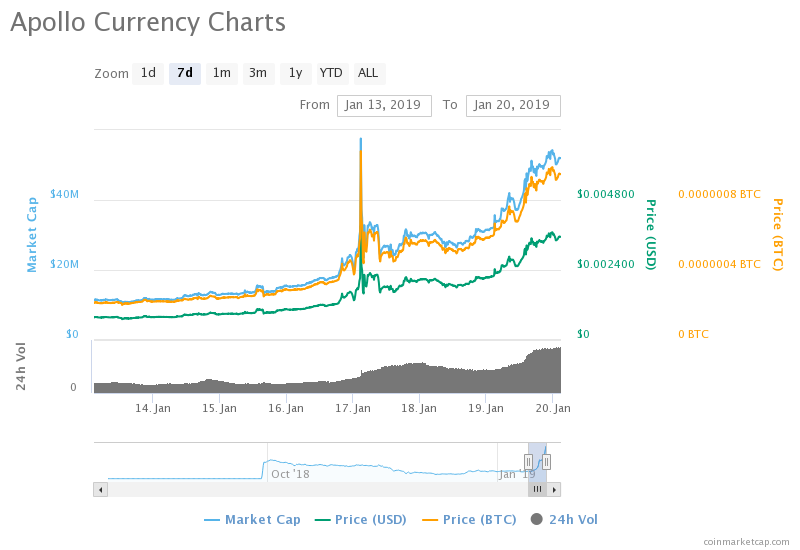 Seven days ago, this cryptocurrency was trading at $0.000789 but had taken a big surge to trade at $0.0035. It recorded a percentage rise of 332%. It currently has a market cap of $50 million. Also, its available supply is 14 billion and a total supply 21 billion. 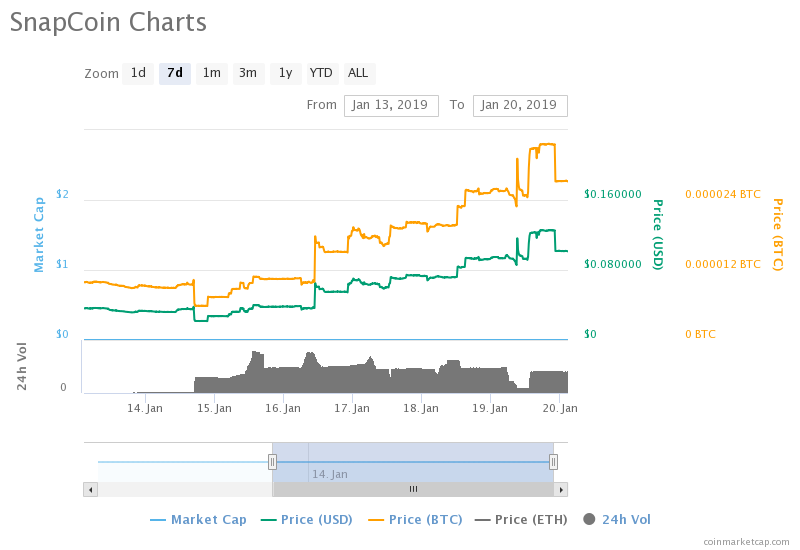 SnapCoin was trading at $0.035 on 12 January 2019 but recorded a significant rise of 254% to trade at $0.122 on 19 January 2019. It has a total supply of 735 million. SnapCoin is one of the least recognized digital assets in the market. Looking at its number of days in existence and its performance, SnapCoin can be tipped for greatness. 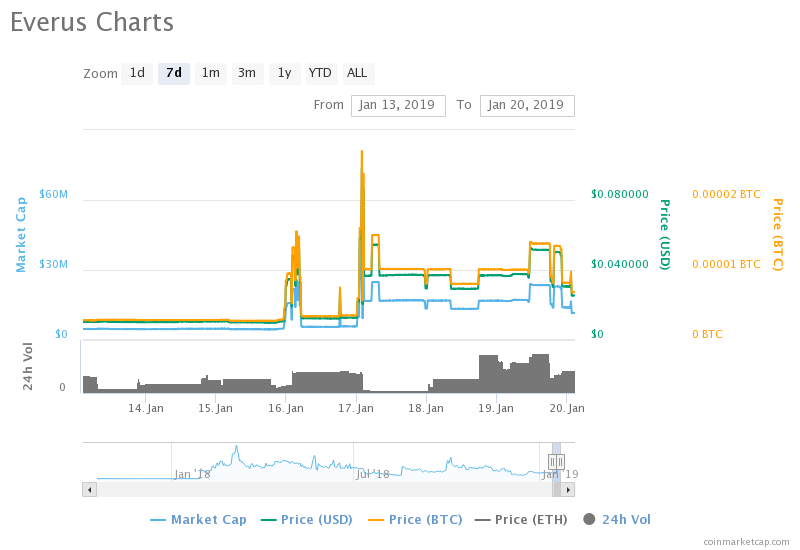 On January 15, 2019, Snapcoin recorded its all-time low price of $0.0125. 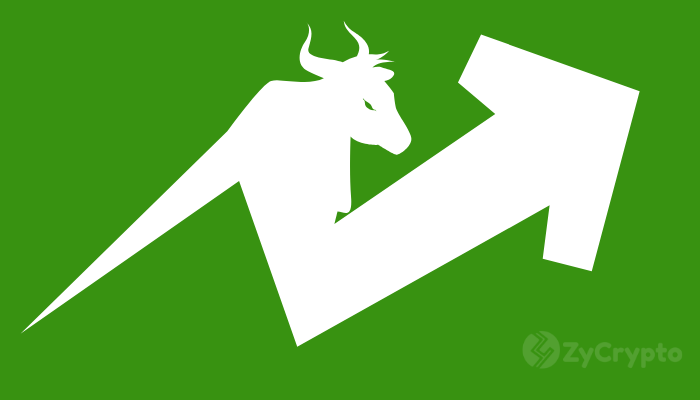 On 19 January 2019, it recorded its all-time high price of $0.123. It is widely reported that most of the newly introduced cryptocurrencies record good performance due to speculations, and their prices are not usually a true reflection of the market. 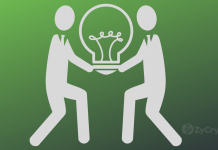 On this note, investors should do their own research before they invest in these assets.